No matter how attractive and ‘must have’ your product or service seems to be, a strictly limiting yourself to your domestic market will have a finite capacity. And once you have reached saturation point, what then? Because of these limitations wise business owners are looking to go global and exploit the many international trade opportunities – after all, in the global economy; practically every country is a potential customer. 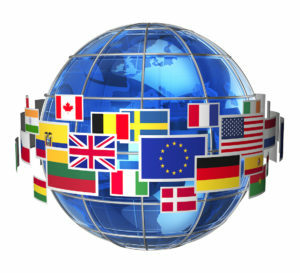 Your home market may be struggling due to economic pressures, but if you go global, you will have immediate access to a practically unlimited range of customers in areas where there is more money available to spend, and because different cultures have different wants and needs, you can diversify your product range to take advantage of these differences. Unless you’ve got your pricing wrong, the higher the volume of products you sell, the more profit you make, and overseas trade is an obvious way to increase sales. In support of this, UK Trade and Investment (UKTI) claim that companies who go global are 12% more likely to survive and excel than those who choose not to export. Benefit from the economies of scale that the export of your goods can bring – go global and profitably use up any excess capacity in your business, smoothing the load and avoiding the seasonal peaks and troughs that are the bane of the production manager’s life. Statistics from UK Trade and Investment (UKTI) state that companies involved in overseas trade can improve their productivity by 34% – imagine that, over a third more with no increase in plant. Take advantage of currency fluctuations – export when the value of the pound sterling is low against other currencies, and reap the very real benefits. Words of warning though; watch out for import tariffs in the country you are exporting to, and keep an eye on the value of sterling. You don’t want to be caught out by any sudden upsurge in the value of the pound, or you could lose all the profit you have worked so hard to gain. Because you are exporting to a wider range of customers, you will also gain a wider range of feedback about your products, and this can lead to real benefits. In fact, UKTI statistics show that businesses believe that exporting leads to innovation – increases in break-through product development to solve problems and meet the needs of the wider customer base. 53% of businesses they spoke to said that a new product or service has evolved because of their overseas trade. If you are interested in finding out how to tailor your message for international trade, contact TTC wetranslate for free, no-obligation consultation by calling +44 (0)1245 216933 or email levent@ttcwetranslate.com.